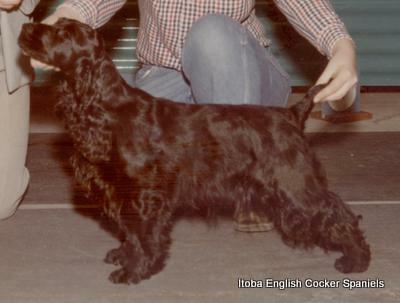 Kenobo Dancer in the Dark, whelped 3/5/74 was my first English Cocker Spaniel. 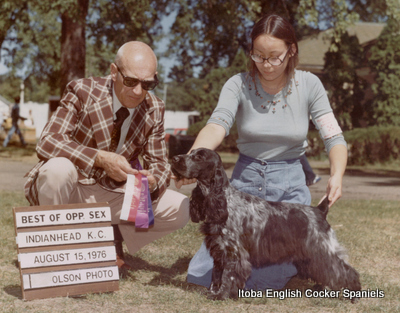 “Phoebe” was bred by Helga Tustin, Kenobo English Cocker Spaniels who entrusted her to a novice, but eager teenager! She was sired by Ch. Dunelm Galaxy out of Ch. Kenobo Silver Charm. 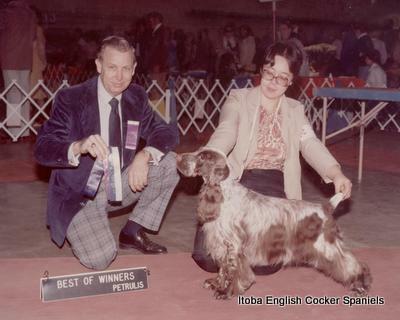 “Phoebe” hated the show ring and while she garnered several points towards her title, she ended her brief career as a show dog and became the foundation of Itoba English Cocker Spaniels. Many of my current winners can be traced back to her. Ch. 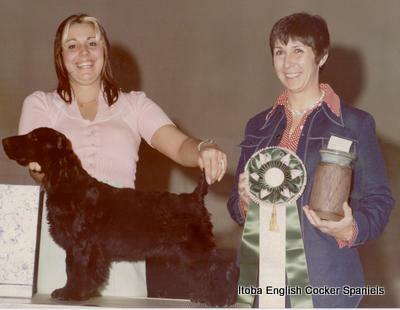 Itoba Star Burst, (left) whelped November 28th, 1975, was our first homebred champion out of our first litter, and littermate, Ch. Itoba Blue Mischief, CD, (right) our first performance titled dog. “Star” was handled to all of her wins by my sister Bernice Baker, a young teen at the time. 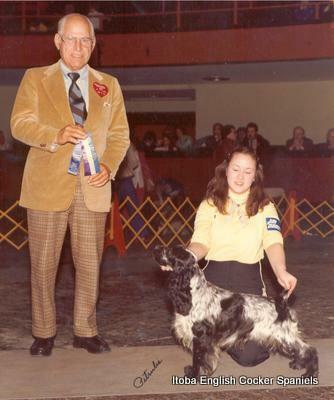 “Star” was Best of Breed at the Manitoba Cocker Specialty in 1977, under Joe Braddon, of the famous “of Ide” Cockers in England, and went on to win a Sporting Group II. 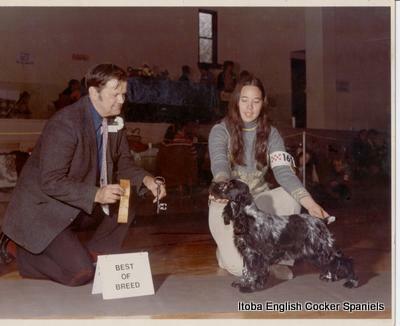 “Blue” shown to both his conformation and obedience titles, by my sister Jean Baker Hanle, also while a teenager. A third littermate, Itoba Dark Meadow, garnered major points before his untimely passing, but it is through him that my current dogs can be traced back to this inaugural litter. These dogs were sired by Ch. Pride Acre’s Lord Blaze Kieran and out of Kenobo Dancer in the Dark. Ch. Itoba Star Burst winning the breed from the classes under Joe Braddon. Itoba Dark Meadow winning a major under Wayne Fessenden. Ch. 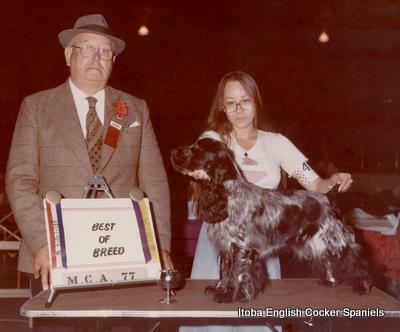 Itoba Baretta, whelped June 2, 1976, owned and loved by Lynn Amacher-Malm, was from our first hybrid breeding. 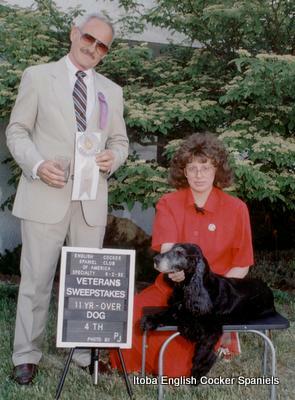 “George” distinguished himself early in his career by winning Best in Match at his very first match, under Joyce Dingman. Shown to his title by Lynn, “George” was handled during his brief specials career by Mac Hesser and garnered several group placings. “George” was sired by Ch. Ribbon Raider’s Silver Salute out of Itoba No Jive. “Hilary” was named with the prefix “Itoba” but was not bred by us.